When soil becomes compacted, grass roots can suffer from a lack of water, nutrients and oxygen. This problem is common with new homes which have sod laid on subsoil that is higher in clay content and more compact than topsoil. Foot traffic and riding mowers help compact soil to the extent that roots may no longer grow and fertilizer can't get to the roots that remain. In extreme cases, as on forest hiking paths, grass quits growing altogether. Moreover, compacted lawns tend to require more frequent and extensive watering during drought periods. Core aeration is the solution to over-compacted soil problems. 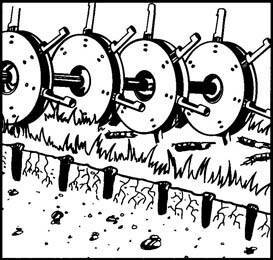 Aeration is the act of removing numerous small plugs of earth to give the soil some "breathing room". It lets grass grow healthier by letting roots go deeper and wider. Also, water and fertilizer penetrates better. If you're at all comfortable with yardwork, you can easily accomplish this job by renting the proper equipment: specifically, rent a closed-tine aerator that will remove plugs of soil and deposit them on the surface of your lawn. In about a week, these cores of dirt will dissolve into the thatch layer (matted underlayer of dead and dying grass) and help it deteriorate into topsoil. Thatch can develop into a concern, as well. The problem of "starving" roots can be further complicated if your thatch layer exceeds one-half inch. This too can block vital resources from penetrating the soil surface. In this case, rent a dethatcher or power rake to remove thatch from the soil surface. Again, this is a simple procedure and we can offer advice if you need it. This should be done early in spring or in autumn, when grass is actively growing. After aerating and de-thatching is a good time to spread grass seed, for a lush lawn that chokes out weeds. The average lawn should be aerated at least once per year, depending on the level of traffic and compaction. Both spring and fall are ideal times to aerate cool season turfgrasses, such as perennial ryegrass or Kentucky bluegrass. Fall aeration is done between August and October. Spring aeration is performed between April and May. Also, be sure to water heavily a couple of days before aerating. This allows the aerator maximum penetration and effectiveness. Water the lawn after aeration too, to help the plugs dissolve and start the thatch decomposition process. Although aeration is beneficial for lawns, it can also initially make your lawn more vulnerable to weed invasion. Apply fertilizer after aeration to help the lawn compete against weeds. For the worst soils, the first aeration may not be enough. But lawns that are regularly aerated, fertilized and watered will remain healthier, more vigorous and easier to maintain than lawns that are neglected. Well, that's aeration in a nutshell. For more information, or to rent one of the items mentioned, drop by and see us.